CAN YOU ESCAPE? 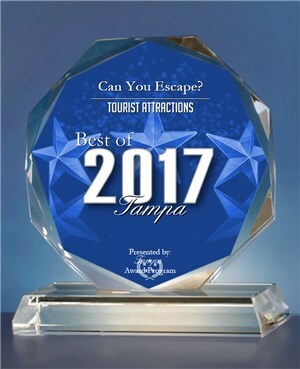 WINS BEST TOURIST ATTRACTION IN TAMPA AWARD - Escape Room Tampa, Florida | Can You Escape? Best Tourist Attraction in Tampa Award for Can You Escape? TAMPA July 6, 2017 -- Can You Escape? has been selected for the 2017 Best of Tampa Award in the Tourist Attractions category by the Tampa Award Program. “We are tremendously excited to receive the best tourist attraction in Tampa award. We love what we do here and are humbles by all of the praise and recognition that we have received lately,” said John Collins, founder and owner of the independently owner escape room, Can You Escape?. This stands as the second award Can You Escape? has received in the last 30 days. Various sources of information were gathered and analyzed to choose the winners in each category. The 2017 Tampa Award Program focuses on quality, not quantity. Winners are determined based on the information gathered both internally by the Tampa Award Program and data provided by third parties.